Copenhagenize.com - Bicycle Urbanism by Design: Bicycle Commuting or Bicycle Culture? 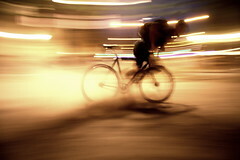 Bicycle Commuting or Bicycle Culture? Unless you've been living in a shoebox (or Prague) for the past three or so years you've probably noticed that cycling levels have been rising in cities all over the world. Through this blog and through numerous journeys I've done to four continents over the past two years I've seen in great detail how various people in various countries and cultures are working to promote urban cycling. One thing I've noticed by haven't really commented on at length is how cycling promotion is largely divided into two schools. Two genres, if you like. For the purpose of this article I'm not going to get into how far too much bicycle advocacy leans up against environmentalism with its preachy, jehovas witness messages about health and saving the planet and fun. To many they may sound like the same thing, pedalling hand in hand down the cycle track. Unfortunately, there appears to be a clear-cut division. It seems more often than not to be a regional or even cultural divide. I've determined that the majority of bicycle advocacy in the Anglo-Saxon New World (and to some extent the UK) is focused on this thing called Bicycle Commuting. As though the main purpose of owning a bicycle is to get to and from work. This commuting angle really dominates the advocacy. There are many volumes written about the influence of protestant immigrants on the work ethic prevalent in North America and Australasia, every bit of written by people who know more about it than I. I think what finally made me try to get this into words is a used book I bought last week. One I've read before, many years ago. The Protestant Ethic and The Spirit of Capitalism, based on a series of articles by Max Weber in 1904-05 and published in book form in 1920. If we look at this from an 'overcomplication of a simple thing' point-of-view, this Bicycle Commuting angle is hardly cycling simplified. It is primarily advocated by 'avid cyclists' who happily commute long distances to get to work. Which is great for them. Unfortunately, it sends signals to the population at large that Bicycle Commuting is a hard slog, a work-out, a sacrifice - however rewarding. It paints a picture of long commutes, even though 50% of Americans, for example, live within 8 km of their workplace. I often look at urban cycling as a product and then look at how we're selling it, comparing it to most other marketing. Bicycle Commuting isn't really effective as mainstream marketing. It's sub-cultural. It involves a massive financial investment. Just look at this "Guide to Cycling in Winter" from the Toronto Star. It's so very silly, but I'm sure that it gives the sporting goods industry a hard on. Then there's the focus on having showers at work. Something that people in established bicycle cultures find to be rather odd. Not having showers at work - I know many people here in Copenhagen who ride long distances and who have showers and changing rooms at work - but it really is a tiny minority. The primary advocates of Bicycle Commuting like gear and showers at work. They like the hard-core aspect of cycling. The sportif aspect. They're 'cyclists' and that's great. I am merely questioning the wisdom of focusing on Bicycle Commuting as the be all, end all of urban cycling. Especially when the voices who speak for this form of advocacy are largely sub-cultural. Never a good way to sell a product. Nor is only presenting The Bicycle has a way to get to work and not much else. So what is this Bicycle Culture genre? It's something we're seeing blossom in many cities around the world. By saying "Bicycle Culture" I mean creating a culture of the bicycle where it becomes an inseparable part of daily life for regular citizens. Instead of something unique that stands out on the urban landscape. I wrote about Behavourial Challenges regarding promoting urban cycling a while back and highlighted the massive growth in a city, for example, like Paris compared to cities where strong bicycle sub-cultures rule the debate. Paris is only one positive example of emerging bicycle cities. I often point to Barcelona as another prime example. They've gone from basically 0% modal split for bicycles to 5% in about three years. Bordeaux has recently reached 10% modal split for bicycles in the city centre. Up from 1 or 2% three years ago. All over France, cities are increasing their bicycle traffic. Over 25 cities have bike share systems. Then there is Spain. Barcelona, San Sebastian, Seville, Zaragoza. Dublin springs to mind, too. Booming. Booming more than any city in North America or Australasia. Bicycle Culture is planting seeds in a garden. Cultivating a bicycle orchard. Bicycle Commuting is a spear-headed "do it like we do, exactly like this" approach and the plethora of how-to guides splattered across the internet is a testament to that. Bicycle Culture, on the other hand, lets people, as the seed metaphor suggests, grow their own foliage. Individual bushes and trees and orchids (uh oh... I can see I'm running out of vocabulary if I keep this flora theme up...) that all contribute to a greater garden. Cities that are working towards cultivating a Bicycle Culture provide the necessary tools; safe, bicycle infrastructure, a good bike-share system, lower speed limits, flexible and favourable traffic laws for bicycles. But there is no real focus on "this is how to do it". In a Bicycle Culture the head gardeners figure that people already know how to ride a bicycle, are equipped with their own built-in risk perception and will figure out the rest. Even in cities with chaotic traffic culture. In Bicycle Culture the bicycle is used to get to the shops, the café, the supermarket, the cinema. As well as to work. Just look at Paris. The pioneers who first embraced the Vélib' bike-share system came to the bicycle from the Metro. Following that typical human desire for the quickest way to get there. The Vélib' beat the Metro and, with accompanying infrastructure, it boomed. I've read that 2 million private bicycles have been sold in Paris since Vélib started. Just visit the city and see bicycles everywhere. See the future. So. Which genre is most effective? You can probably figure out where I'm headed already. 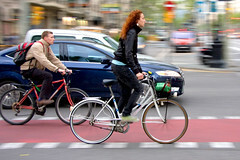 Without a doubt there are many people who have taken up urban cycling because of the Bicycle Commuting approach. Absolutely true. This NPR article is positive, for example. But if you didn't know anything about this funky cycling thing, the article would certainly give you a very narrow-minded impression of what cycling to work is or could be. Especially the "just try to hide the bike grease on your calf at meetings" remark near the end. Buy a chainguard, for god's sake. Or a more functional, comfortable bicycle. They're just as fast anyway. If, on the other hand, we look at what cities are really booming - it is the cities that are planting gardens of Bicycle Culture. Keeping a simple idea simple, providing the basic tools and letting people do the rest. And within... let's say... five years... these cities will be light years ahead of the rest. Embarassingly so. Like everything else, it's all about effective, mainstream marketing.